During HCI 522: “Scientific Methods of Human–Computer Interaction”, we wrote a blog entry each week along with a class presentation. I’ve mirrored my blog entries here in the past. 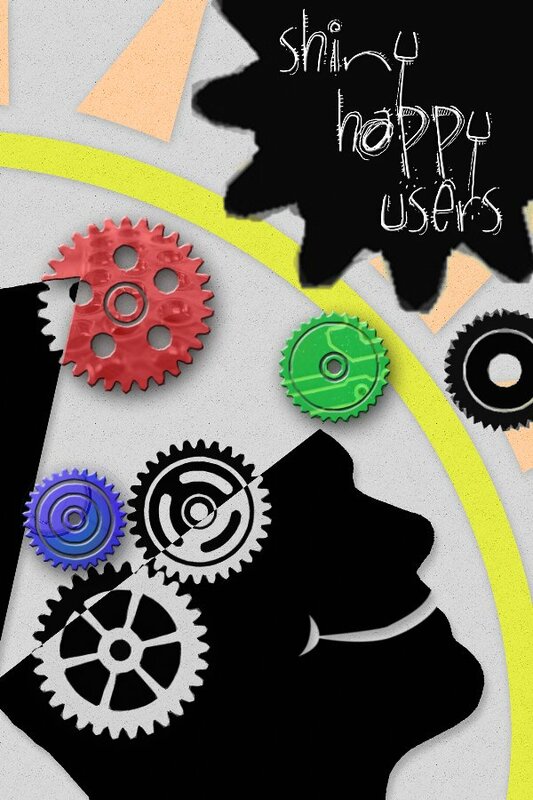 Now we’ve collected our favorite blog entries from that class and compiled them into a book: Shiny Happy Users. We published the book through lulu.com. There’s a hardcover edition and a paperback edition. And if you’re not convinced to buy a copy of the book, you can even download the PDF for free. In addition to the book, we’ve created a companion DVD that contains our video presentations and slides. And if all this weren’t enough, the books and DVD are licensed under a Creative Commons Attribution-NonCommercial-ShareAlike license. That means that you can give copies of our work to your friends and you can make derivatives of our work. Some examples of derivatives would be: translate it into a different language, rework the essays into lecture notes for a class, and transform the work into a different format (say, for e-book readers). Visit the Shiny Happy Users website for more information and samples of the essays and presentations. I did all the typesetting for the book, so I’m sure there are plenty of errors and typos. if you find any, please let me know!